Not every travel reward program is created equal. With more than 125 travel reward programs available to Canadians, it is little wonder consumers are left scratching their head when trying to determine which is best. Picking the right program is combination of matching individual needs with value. Starwood Preferred Guest Starpoints. Only frequent guest program to make top five but with redemptions values as high as 7% can you say “room service”? AIR MILES Reward Miles. Canada’s largest frequent shopping program would have ranked higher but recent flight redemption increases knocked it down. “This year’s ranking of Canada’s top travel reward currencies attempts to simplify the evaluation process and make it easier to determine a program that’s best for you,” added Sojka. Launched in 2001, RewardsCanada.ca is regularly featured in the Canadian media and is considered to be Canada’s premier frequent flyer and travel rewards resource. Updated on a daily basis, the website features news, articles, program information and bonus offers for over 80 travel reward programs. I'd love to hear your comments on the Top 5 Travel Rewards Currencies for Canadians! Sep 29 Update: New Aeroplan Marriott stay offer, Delta MQM offer for Hilton stays, is Diners Club returning soon? Welcome to another week of travel and loyalty rewards here on Rewards Canada! Today may be a little quiet but that doesn't say much for the rest of this week! Stay tuned for some major items to be released over the next few days! 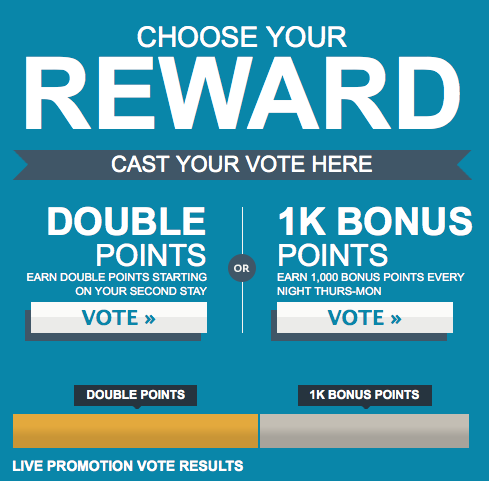 In the bonus offer section, three major promos of note are the Aeroplan Marriott stay offer, the latest set of IHG PointBreaks and the Delta MQM offer from Hilton. Be sure to look into both of these offers! Although it recently had some changes made to it, the best hotel redemption offer continues to be IHG Rewards Club's PointBreaks. Once again there are not that many Canadian properties participating and internationally there is only one InterContinental Hotel participating but of course that does not draw away from any of the hotels on the list as this is a good deal for all of them. The new PointBreaks list we mentioned last Friday are now open for booking for stays from from September 29 to November 30, 2014 (subject to availability) Each Reward Night at these participating hotels will be only 5,000 IHG Rewards Club points during the above mentioned dates. Remember the new PointBreaks rules that a member can only book up to 2 reward reservations per hotel participating in the individual offer (ie 2 at Pointbreaks hotels and 2 at Last Minute Reward Night hotels). My tip to get around this would be to book 2 reservations with one IHG Rewards Club account and then have your spouse book 2 more etc. Of course this is dependent on both accounts having enough points to redeem for these awards. Also be sure to book these ASAP as once the allotted nights are booked at certain locations those hotels will fall off the list. 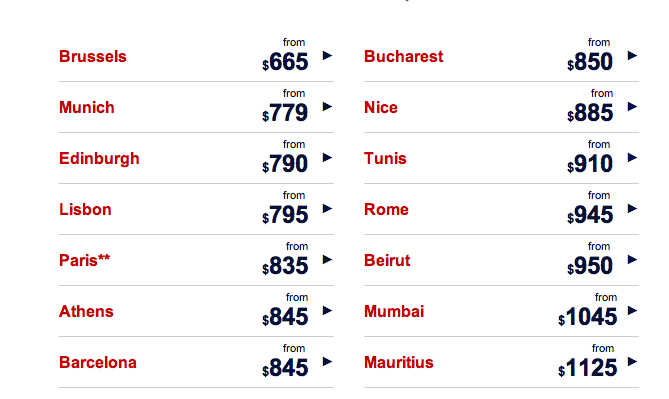 Big bad news from Aegean Airlines Miles&Bonus! We have touched upon this topic a few times here on Rewards Canada but never fully detailed it. What is it? The easiest way to Star Alliance Gold Status via Aegean Airlines Miles&Bonus. It is was quite simple earn 1,000 miles for joining, earn another 3,000 with 12 months and get their Silver Status (Star Alliance Gold) add another 16,000 on top of that within 12 months of reaching Silver and boom you have Gold Miles&Bonus status which equates to Star Alliance Gold and you could keep that status just with one flight credited to Aegean every 3 years.. Rumours had starting going around last week that this was all about to change and the email from Aegean Miles&Bonus yesterday confirmed it. This easy way to keeping Star Alliance Gold status for life has come to an end. Well not really yet, the changes go into effect on November 24th so you could still potentially take advantage of this with one long haul Business Class flight credited to Miles&Bonus. I myself started this challenge earlier this year but took a harder way, crediting some Air Canada domestic flights to Miles&Bonus, I got Miles&Bonus Silver already but don't know if I'll make it to Gold by the time the changes take place. I'm not happy about neither are thousands of others who have used this surefire method as a fast track to Star Alliance status but that is also the reason why this great method is coming to an end. As with most fast tracks, tricks and other ways to work the frequent traveller system, many of them meet their end sooner or later. Now they have made the qualification requirements harder but they are still not that hard to achieve when you compare to some other programs and if you achieve that status it is relatively easy to retain (especially if flying on Aegean or Olympic, somewhat harder if only flying Star Alliance.) You can find out all about the changes here. American Airlines and El Al are ending their frequent flyer partnership on November 1st of this year. Find out more here. 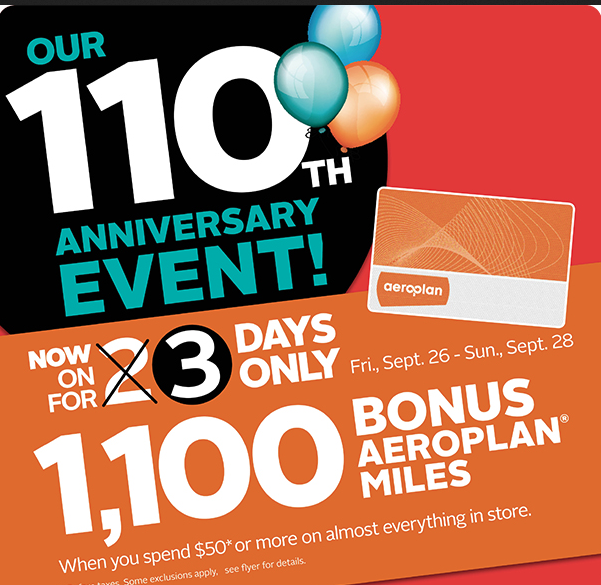 Rexall is turning 110 years old and to celebrate this anniversary they are awarding 1,100 Aeroplan Miles on all eligible purchases of $50 or more! This is a huge bonus, you can earn as much as 22 Aeroplan Miles per dollar! It may not be 'Pudding Guy' or even Star Challenge worthy but this is still a great bonus that you should take advantage of if you can. Here's a tip: If you are planning on spending over $100 then split the purchases so that you can earn the bonus twice and so on. Also use a credit card that has a multiplier on drug store purchases likes the TD Aeroplan Visa Infinite or American Express Gold Rewards cards! The offer is only valid between Friday Sept 26 and Sunday Sept 28. Read more in the flyer here. Middle of the week offerings for you! Planning a trip to Europe? If Lufthansa was on your radar to fly you there here is a voucher offer to save you a little cash on that flight! Simply fill out this form and Lufthansa will send you an exclusive code to save $30 on your next LHflight purchase. You must redeem the voucher (read book your flight) by September 27. We see the return of a very similar offer to those we have seen in the past from British Airways and their Transatlantic oneworld partners. As we see a few times per year this bonus is for flying in a premium fare class (no economy included here like the current United and Air Canada Transatlantic offers) between Canada and the U.K. or Europe. 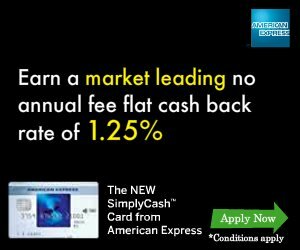 Can't make use of this offer? 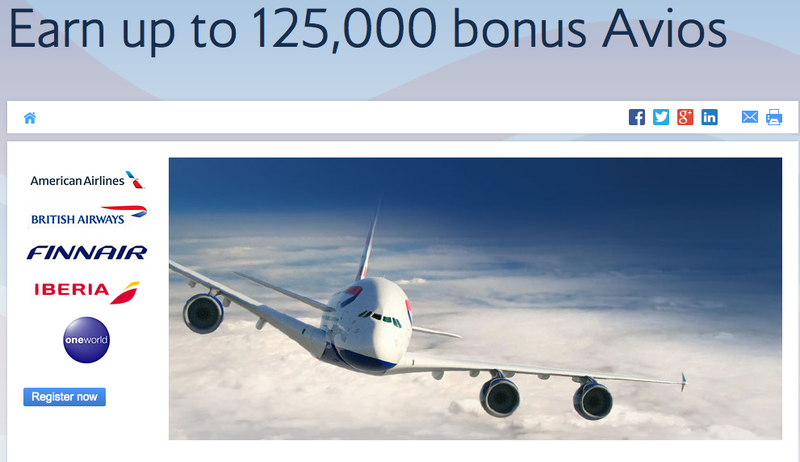 Be sure to visit our Bonus Avios page for tons more bonus earning opportunities!